The 16th Thai Short Film & Video Festival starts at BACC this Thursday, and runs until 26th August. The Festival will open with the Thai premiere of Apichatpong Weerasethakul's new short film, Ashes. The Thai Short Film & Video Festival is Thailand's oldest film festival. The 11th Festival was at Bangkok's now-closed EGV Grand Discovery cinema, though the 12th, 13th, and all subsequent festivals have been hosted by BACC. 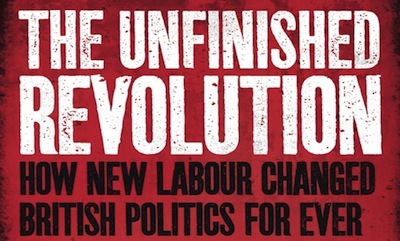 Philip Gould's book The Unfinished Revolution: How The Modernisers Saved The Labour Party has been substantially expanded, and now has a new subtitle: How New Labour Changed British Politics For Ever. The new version reprints the original edition and supplements it with an entirely new second part (similar in organisation, though not in subject, to the expanded edition of Nightmare Movies). The new section covers Labour's three terms in government under Tony Blair and Gordon Brown (though Andrew Rawnsley dealt with the same period more objectively in Servants Of The People and The End Of The Party). Blair has written an extensive foreword to Gould's book, arguing that Brown "took an Old Labour way out of the financial crisis"; advocating a return to the New Labour agenda, Blair even uses that old phrase from the Bill Clinton era, 'the Third Way', which is hardly likely to inspire a revival of Labour's fortunes. Dieter Rams: As Little Design As Possible, written by Sophie Lovell and published by Phaidon, profiles one of the world's most famous industrial designers. Dieter Rams, who was head of design at Braun for over thirty years, designed hundreds of consumer products, including the ET66 calculator, the iconic white SK4 record player, and the aluminium T1000 world-band transistor radio. The book includes a foreword by Jonathan Ive, Apple's chief designer, who is the nearest equivalent to Rams in contemporary industrial design. Working with Steve Jobs, Ive produced a series of consumer-technology devices (including the iMac, iPhone, iPod, and iPad) that conformed to the "ten principles of good design" that Rams formulated. Rams felt that successful design should be innovative, useful, aesthetic, understandable, honest, unobtrusive, long-lasting, thorough, environmentally friendly, and should involve "as little design as possible". That last maxim, adapted from Mies van der Rohe's 'less is more', became the title of Lovell's book. In her preface, Lovell writes that Rams told her: "Why on earth do we need another book about me?" Thus, while there are occasional quotes footnoted as "Rams, in conversation with the author", Rams clearly didn't give Lovell a formal interview. There are, however, plenty of glossy photos fetishising beautiful radios, clocks, and other objects from the past fifty years. Christian Bale, Michael Caine, Morgan Freeman, and Gary Oldman reprise their roles from the two previous Batman films, and there are two new villains: Bane (Tom Hardy) and Catwoman (Anne Hathaway). [Incidentally, Gary Oldman has become Gary Old Man: the Oldman of The Dark Knight Rises and Tinker Tailor Soldier Spy seems far removed from the Oldman of Nil By Mouth or True Romance.] Marion Cotillard and Joseph Gordon-Levitt, who appeared with Hardy and Caine in Inception, also star in The Dark Knight Rises. 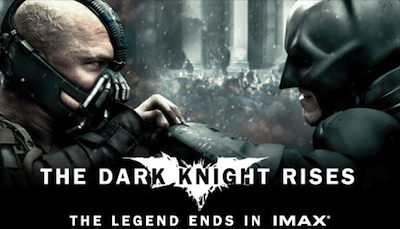 The Dark Knight Rises is most interesting as a celebration of analogue film technology at a time of digital transition. Nolan is (alongside Quentin Tarantino) one of the last Hollywood directors to use 35mm film cameras; even Martin Scorsese (Hugo) and Steven Spielberg (Tintin) have now made digital films. 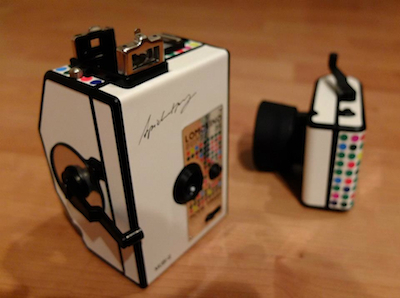 Nolan has actively campaigned for the preservation of analogue cameras and projectors, recognising that digital production and exhibition are cheaper yet technically inferior. Nolan is also notable for his use of traditional sets and special effects, minimising the use of CGI. Yesterday, Sight & Sound magazine announced the result of its decennial film poll: a list of the ten greatest films ever made, selected by film critics from around the world. For film-poll connoisseurs (including myself), Sight & Sound's list is the ur-list, the first and most authoritative guide to classic films. 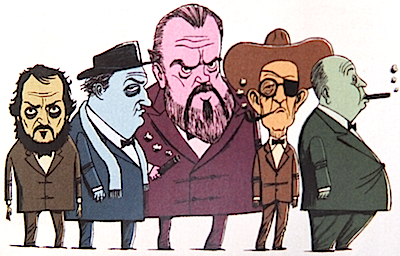 The poll was originally conducted in 1952 (with Vittorio de Sica's Bicycle Thieves at #1); in the second poll, in 1962, Orson Welles's Citizen Kane was #1, and it remained in pole position throughout each subsequent poll. This year, however, Citizen Kane was displaced by Alfred Hitchcock's Vertigo (which came a close second to Kane in the previous list, in 2002). This year's new entries include The Searchers and The Passion Of Joan Of Arc (both of which skipped a list, appearing in 1992 though not in 2002). Man With A Movie Camera, the other new entry, is the first documentary to appear in a Sight & Sound list. Man With A Movie Camera has replaced another Russian silent classic, Battleship Potemkin, which had appeared on every Sight & Sound list since 1952; the relegation of Battleship Potemkin (to #11) leaves The Rules Of The Game as the only film to have appeared on every list. Apart from Battleship Potemkin, two other films from the 2002 list are also missing from this year's top ten: Singin' In The Rain drops to #20, and The Godfather (now counted individually, rather than as a joint entry with The Godfather II) falls to #21. Surprisingly, Apocalypse Now (at #14) received more votes than The Godfather, making it Francis Coppola's most acclaimed film. The magazine also surveyed film directors, to produce a separate top ten (with Tokyo Story at #1, and Citizen Kane and 2001: A Space Odyssey jointly placed at #2). 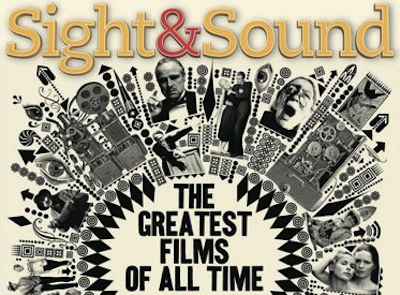 Both lists, and the individual choices of many of the critics and directors, appear in Sight & Sound's current issue. The ten greatest films will be shown at the BFI Southbank cinema in London, from 1st September to 9th October. The top three will be shown at the UK's National Media Museum in Bradford on 16th September. 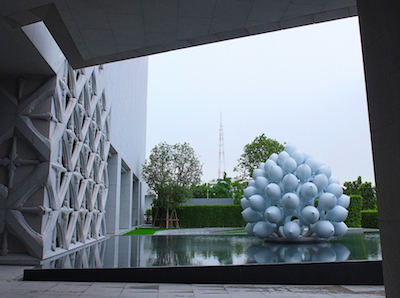 The Museum of Contemporary Art opened in Bangkok earlier this year. The six-storey Museum is an imposing granite building, and feels appropriately like a Modernist cathedral for art. 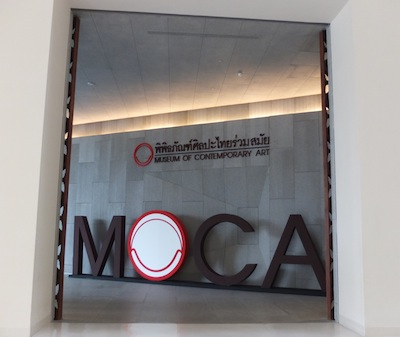 MoCA was funded entirely by Boonchai Bencharongkul, founder of the DTAC telecommunications company. 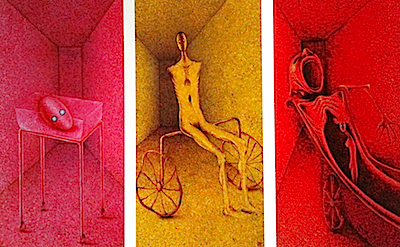 Boonchai is also Thailand's leading art patron, approximately equivalent to Charles Saatchi in the UK. Like Saatchi, Boonchai gobbles up new art: with vast financial resources and determination, he doesn't just dominate the local art market, he is the local art market. Boonchai not only paid for the Museum's construction, he also filled it exclusively with his own art collection, and personally curated each gallery. Highlights include Birth-Ageing-Sickness-Death (a vivid oil triptych of disturbing figures by Kittisak Chanontnart, influenced by Freudian psychoanalysis) and Animal-Man Family (Anupong Chantorn's bronze dogs from his Hope In The Dark exhibition, presumably commissioned by Boonchai). These are the exceptions, however. The Museum's permanent collection reflects Boonchai's personal taste, and unfortunately his taste is largely traditional. Thus, there is no political art at all, and representation of contemporary life is almost entirely absent. Instead, there are numerous galleries filled with religious and mythological paintings. Also, the collection consists entirely of paintings and bronze sculptures: there is no video art, photography, installation, digital, or new-media art of any kind. Indeed, much of the collection is not even particularly recent. The ground floor contains works by Silpa Bhirasri from almost 100 years ago, and there's a collection of Victorian-era paintings on the fifth floor. The Museum's name is somewhat misleading, because the art there is largely modern rather than contemporary. So, MoCA is an impressive building, with an extensive yet traditional art collection. It's like a conservative version of the Saatchi Gallery: a grand showcase for a formidable patron's personal taste. 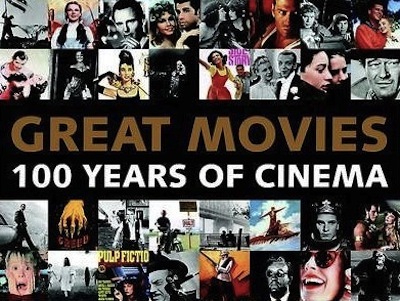 Great Movies: 100 Years Of Cinema, by Andrew Heritage, is a guide to 100 classic films divided into ten genres. The films are listed chronologically within each section. Two pages are devoted to each film; there are plenty of glossy colour photos, though the text does little more than summarise each film's plot. There is no western category, so High Noon and The Searchers appear in the Action/Adventure section and Once Upon A Time In The West is in the Historical section. Some of the other classifications are also rather odd: Pulp Fiction is listed under Comedy rather than Thriller/Crime, and Dr Strangelove is in the War section rather than the Comedy section. The author admits that the final category, Drama, is "an opportunity, within limited space, to attempt to include any movies that simply didn't fit into the preceding nine genre categories" (hardly an ideal solution). The book also includes brief articles on significant film movements, such as the French New Wave, documentaries, realism, and underground cinema. However, these should really have been included in the main 100 list instead of being relegated to supplementary sections. There are a few mistakes regarding technical details: the prologue to The Wizard Of Oz is described as "sepia black and white" (they are two different formats), there is a reference to "Blu-ray Avatar" (Blu-ray is not a theatrical format), a photo of a 35mm camera has a "digital camera" caption, and Inception is used as an example of "digital special effects" (visual effects are digital, special effects are analogue; Inception is notable for its analogue special effects). A famous line from Taxi Driver, "You talkin' to me? ", is twice misquoted as "Are you looking at me?". There is a brief bibliography, though it's rather outdated as it consists almost entirely of annual film guides that are no longer being published (Halliwell's, Time Out, etc.). It even cites the "invaluable Filmgoer's Companion", a book which was superseded long ago by Ephraim Katz's Film Encyclopedia.